With this 3-day journey through the sights and sounds of Sedona your group will be able to appreciate the unending natural beauty, cultural attractions, and wealth of knowledge that surrounds this fun desert city! On this trip you will have the opportunity to see the most popular and most photographed sites in all of Arizona, providing your group with endless geological and natural history lessons. Your group will be able to take in the history of the railroad, mining, and pioneer settler days, as well as the era of frontier cowboy and ranchers, all while touring the rustic red and orange countryside surrounding gorgeous Sedona. See one of the most unique and structurally beautiful chapels built in the state of Arizona at Chapel of the Holy Cross, explore the natural water slides of Slide Rock State Park, and discover just what makes Devil’s Bridge so unique! Hike all the most beautiful trails, take a ride on a historic yet beautifully restored local train, and even see ancient Native American dwellings. This trip is perfect for any history buff, naturally curious beauty lover, or fan of red rock scenery or Arizona in general! Palatki Heritage Site - The Palatki Heritage Site and Ruins are located in Coconino National Forest and sit alongside their sister site Honanki. These two sites combine made up the largest dwellings in Red Rock County between 1150 and 1350 AD, a time when the Sinagua people of the Ancient Pueblo Peoples settled in this area. Your group will have the opportunity to see these ancient cliff dwellings and pictographs that are sheltered by colorful cliffs or red canyon. Take one of three trails in the area, one leading to the Sinagua cliff dwellings, one giving a great view of the dwellings, and another one showing the alcoves with painted symbols and pictographs from Verde Valley cultures throughout history. All of these trails are just quarter mile one way, making them easily accessible. See the two pueblos in Palatki that were built under south-facing overhangs and really immerse yourself into the natural beauty and cultural history found in every direction here. Devil’s Bridge - Though it is called a bridge, this next stop at the edge of Wide Valley on the North side of Capitol Butte is actually a red rock arch. This natural attraction is among the most viewed in the region, a geological wonder created by wind and weather erosion and not by flowing water, and an extremely heavily traveled one at that! There is a small trail head along Dry Creek Road that allows your group to take a minimum hike of 0.8 miles to get to the arch, however you must have a four wheel drive vehicle to use that access road. If you don’t, you just follow the road down about another mile and hike it from there, adding a more scenic route for your group along the way. The main path ends beneath the arch and ascents at the top, where the views up and down the canyon, over red and white rocks, and westwards across Wider Dry Creek Valley to the mesas of the red rock wildlife area, are absolutely unbeatable! Slide Rock State Park - Slide Rock State Park, located in Oak Creek Canyon within the Coconino National Forest, was dedicated officially as a U.S. Forest Service managed park in 1985. This state park is actually one of the most noted and popular tourist attractions in Arizona, attracting crowds of locals and tourists alike in massive quantities each day. 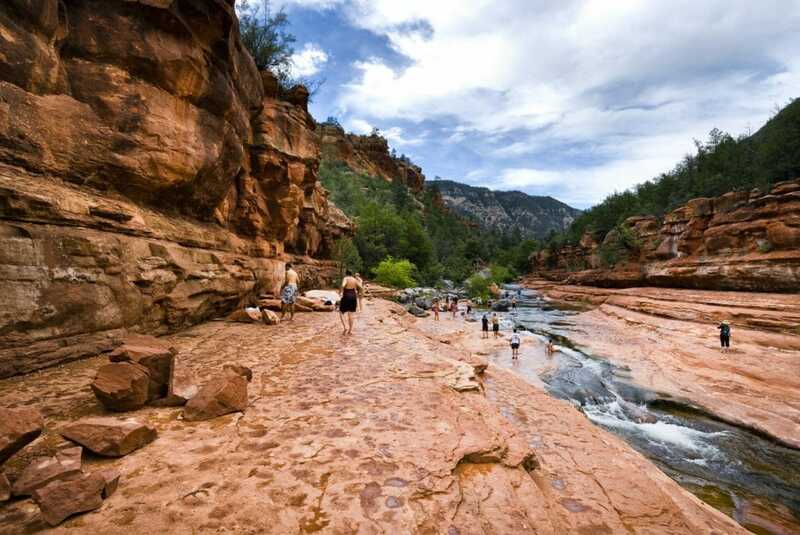 The name, Slide Rock Park, comes from the natural waterslide formed by the slippery bed of Oak Creek. This must-see destination was voted in 2014 as a Top Ten State Park in the United States by Fodor’s Travel and the fifth best swimming hole in the United States by USA Today. This destination is honestly the perfect place to see the region and also get a chance to cool off on a natural waterslide, excellent swimming holes, and wade through a historic irrigation system still in working condition today! Take in all the great wildlife, geology, and history here at Slide Rock State Park, and have fun doing it too! Sedona Heritage Museum - Located in a 4.8 acre historical oasis known as Jordan Historical Park, your group will find the Sedona Heritage Museum. This Uptown Sedona attraction was established in 1998, once a historical homestead for the Jordan Family, now a museum working to preserve the ever-growing history of Sedona. The focus of this establishment is on the lifestyles and works of people who pioneered the community, from 1876 to today, as well as the surrounding community, education, historic preservation, and restoration of the community. Once here your group will get to explore any of the many excellent regular exhibits which highlight things such as Early Settlers, Ranching and Cowboys, the Orchard Industry, Sedona based movies, or the town’s namesake, Sedona Schnebly. Take a self-guided audio tour or docent-led tour as you explore the historic themes and rich stories of Sedona's past, the history-themed programs, or the many interactive educational activities throughout. Verde Canyon Railroad - Welcome to Arizona’s longest running nature show, the fully restored vintage train that has seen over 100 years of rail service, the Verde Canyon Railroad. Over 90,000 people per year experience the sights of this famous route and revel in the casual elegance of train travel as they discover the heritage of the landscape of Clarkdale and Drake, Arizona. Once aboard this gorgeous train you will see for yourself the scenic and historic treasure that is the route of Verde Canyon as you go on a four-hour excursion through 20 miles of 100 years of history. Enjoy the thoughtful decor and friendly, informative attendants as you sit aboard the open-air cars with canopies, inside climate controlled cars, or choose between caboose, first class, or coach pullman-style seats. Let the FP7 locomotive take you away, as two of the only 10 trains of the sort available in North America today! Cathedral Rock - Start your morning off at the gorgeous and awe-inspiring Cathedral Rock, a famous landmark on the Sedona skyline, located within the Coconino National Forest. This natural attraction is one of the most photographed sights in all of Arizona, a redbed sandstone formed from coastal sand dunes near the shoreline of the ancient Pedregoso Sea. Here you will find a summit elevation height of 4,921 feet, as well as several interesting geological ripple marks along the way and even a black basalt dike within the first saddle point in the rock formation. Any way you take this trail it is usually known more as a rock climb than a hike, a mostly un-shaded and steep hike that ranges anywhere from 0.7 to 2.9 miles, depending on where you start and finish. Any way you go, however, the panoramic views are incredible and the natural geology lessons throughout are worth the exercise you’ll be getting along the way! Chapel of the Holy Cross - End your time in Sedona at the famed Chapel of the Holy Cross, the Roman Catholic Chapel built into the beautiful buttes of Sedona within the Coconino National Forest. This church is run by the Diocese of Phoenix and is part of the St. John Vianney Parish in Sedona, a particular branch established in 1956 upon completion of the building, which was begun in 1932. In 1957 this chapel won the Award of Honor by the American Architecture Association and in 2007 it won the title of one of the "7 Wonders of Arizona" by the state board.When you get to this sight you will see how beautifully the chapel rises out of the surrounding red rocks, a towering cross that gives an awesome panorama of the surrounding buttes, valleys, and the seemingly never ending Arizona sky. This church serves as a source of inspiration to the community inviting rest and reflection to all who visit. There are great photo opportunities in every direction you look, and inside you will find a gift shop complete with not to be missed, unique religious articles!